There were 551,000 job vacancies in Canada in the third quarter, up 83,000 (+17.8%) from the third quarter of 2017. Over the same period, the job vacancy rate increased 0.4 percentage points to 3.3%. This was the eighth consecutive quarter with a year-over-year increase in both the number of job vacancies and the job vacancy rate. The number of job vacancies in Canada (unadjusted for seasonality) was little changed from the second to the third quarter. By comparison, vacancies rose slightly from the second to the third quarter of 2016 (+3.5%) and from the second to the third quarter of 2017 (+1.8%). In the third quarter, both the number of job vacancies and the job vacancy rate rose in every province on a year-over-year basis, a first since the beginning of the series in 2015. 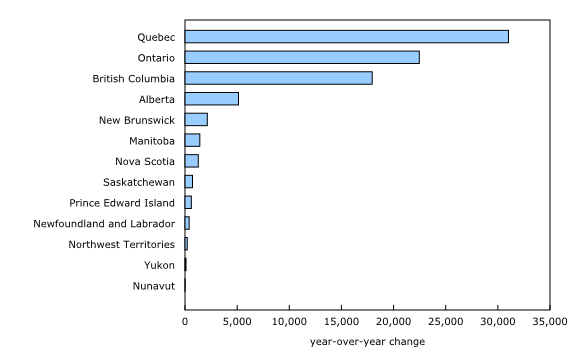 Quebec, Ontario and British Columbia reported the largest increases in the number of job vacancies. Job vacancies also rose in the Northwest Territories, but were little changed in Yukon and Nunavut. There were 31,000 (+35.5%) more job vacancies in Quebec than in the same quarter one year earlier. The rise was widespread across most sectors, with health care and social assistance; accommodation and food services; and manufacturing accounting for close to half of the provincial increase. By comparison, these sectors accounted for about one-third of employment, according to the Job Vacancy and Wage Survey. On a year-over-year basis, the job vacancy rate in Quebec rose by 0.7 percentage points to 3.2%, the second largest provincial increase after Prince Edward Island. After having one of the lowest job vacancy rates among the provinces from 2015 to the first half of 2017, higher demand for labour in Quebec helped push its rate closer to the national average (3.3%). The number of job vacancies was up 22,000 (+12.2%) in Ontario compared with the third quarter of 2017. Job vacancies rose in 11 of the 20 sectors, led by health care and social assistance. Following two consecutive quarters of year-over-year declines, vacancies in accommodation and food services rose by 8.3% in the third quarter. In Ontario, the average offered hourly wage increased by 19.2% in accommodation and food services. The year-over-year wage gain for this lower-wage sector coincided with a notable rise in the provincial minimum wage since January 2018. Compared with the same quarter a year earlier, the job vacancy rate in Ontario was up 0.2 percentage points to 3.2% in the third quarter. In British Columbia, job vacancies increased by 18,000 (+19.4%) compared with the third quarter of 2017, led by construction (+5,900 or +70.3%). The job vacancy rate in the province rose by 0.6 percentage points to 4.8%. Employers in Alberta reported 5,100 (+9.5%) more job vacancies compared with the same quarter one year earlier. On a year-over-year basis, this rate of increase was somewhat slower than the rate in the five previous quarters (around 20%). Increases in health care and social assistance (+2,000 or +56.5%) and transportation and warehousing (+1,800 or +56.0%) were partially offset by declines in accommodation and food services (-1,100 or -10.7%) and construction (-800 or -12.1%). The job vacancy rate in Alberta rose 0.2 percentage points year over year, to 2.9% in the third quarter. Among the smaller provinces, Newfoundland and Labrador saw its number of job vacancies rise by 400 (+11.3%) from the third quarter of 2017 to the third quarter of 2018, the second consecutive year-over-year increase following decreasing or stable job vacancies since the beginning of the series in 2015. A number of sectors contributed to the rise, notably retail trade (+200 or +55.4%) and health care and social assistance (+100 or +20.4%). The increase in vacancies, combined with a decrease in employment, helped push the provincial job vacancy rate up 0.3 percentage points to 1.9% over the same period. Job vacancies rose in 50 of the 69 economic regions (ERs) in the third quarter, with Laurentides, Quebec (+58.6% or +2,500) and Lanaudière, Quebec (+45.1% or +1,400) registering some of the largest percentage increases among the ERs on a year-over-year basis. Increases in the job vacancy rate were also widespread across ERs, led by Cariboo, British Columbia (+1.3 percentage points) and Chaudière-Appalaches, Quebec (+1.3 percentage points). The proportion of vacancies that were for full-time work differed greatly across occupational groups. For example, in the third quarter, all of the vacancies reported for managers in natural resources production and fishing; managers in manufacturing and utilities; and underground miners, oil and gas drillers and related occupations were for full-time work. By contrast, less than one-third of vacancies for cashiers (25.8%), athletes, coaches, referees and related occupations (26.1%), and retail salespersons (30.5%) were for full-time jobs. In the third quarter, the average offered hourly wage for part-time vacancies ($16.90) was noticeably lower than the offered wage for full-time vacancies ($22.45). The relatively higher wage offered for full-time vacancies may reflect a number of factors, including differences in the occupational composition of full-time versus part-time vacancies, as well as differing wages offered for a full-time vacancy versus a part-time vacancy for the same occupation. In the third quarter, over 9 in 10 job vacancies for supervisors, logging and forestry; managers in communication (except broadcasting); as well as butchers and bakers were for permanent positions. By contrast, this proportion was less than half for university professors and post-secondary assistants; harvesting, landscaping and natural resources labourers; as well as secondary and elementary school teachers and educational counsellors. In the third quarter, the offered wage for vacancies for permanent positions was $21.35, versus $19.35 for temporary positions. The minimum level of education sought for nearly two-thirds (63.3%) of job vacancies reported in the third quarter was a high school diploma or less, compared with 11.7% for which a bachelor's degree or higher was required. There were, however, important variations across occupational groups. Over three-quarters of job vacancies for therapy and assessment professionals; civil, mechanical, electrical and chemical engineers; and social and community service professionals required a bachelor's degree or higher. This contrasts with cashiers; labourers in processing, manufacturing and utilities; and occupations in food and beverage service for which a high school diploma or less was required for nearly all job vacancies. The proportion of vacancies requiring a bachelor's degree or higher has ranged from 10.5% to 12.9% since the beginning of the series in 2015. The offered wage rose with the level of education required, with an average offered wage of $41.75 for job vacancies that required a university certificate or diploma above the bachelor's degree, compared with $16.10 for vacancies for which there was no minimum level of education. The Job Vacancy and Wage Survey (JVWS) provides comprehensive data on job vacancies and wages by industrial sector, detailed occupations, and the level of education sought for Canada, the provinces, territories and economic regions. Job vacancy and offered wage data are released quarterly. The annual wage data for 2017 were released on June 26, 2018. With the release of job vacancy data for the third quarter of 2018, data from the first quarter of 2015 to the first quarter of 2018 have been revised to calibrate JVWS employment to revised Survey of Employment, Payrolls and Hours employment numbers. As part of the revision, the industrial classification, as well as the Standard Geographical Classification (SGC), were also updated. 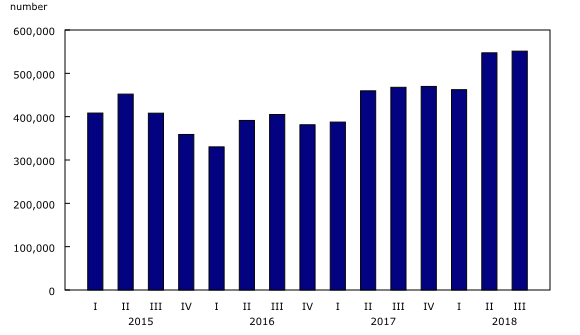 The North American Industry Classification System (NAICS) for estimates from the first quarter of 2015 to the second quarter of 2018 are based on the NAICS 2017 Version 2.0, while estimates for the third quarter of 2018 are based on NAICS 2017 Version 3.0. Job vacancy data based on the two NAICS 2017 versions are fully comparable. All quarters from 2015 to the current quarter are based on the SGC 2016. A permanent job has no pre-determined termination date. A temporary job has a predetermined end date, or will end as soon as a specified project is completed. Some temporary jobs are seasonal when they are linked to a recurring event (e.g., public holidays) or time of the year (e.g., summertime). A full-time job or vacancy requires 30 or more hours of work per week, while a part-time job or vacancy requires less than 30 hours of work per week. The level of education sought is the minimum level of education required for the job vacancies. It includes a category that covers vacancies for which there is no educational requirement. Job vacancy data from the JVWS for the fourth quarter of 2018 will be released on April 11, 2019. To enquire about the concepts, methods or data quality of this release, contact Myriam Hazel (613-219-4345; myriam.hazel@canada.ca), Labour Statistics Division.